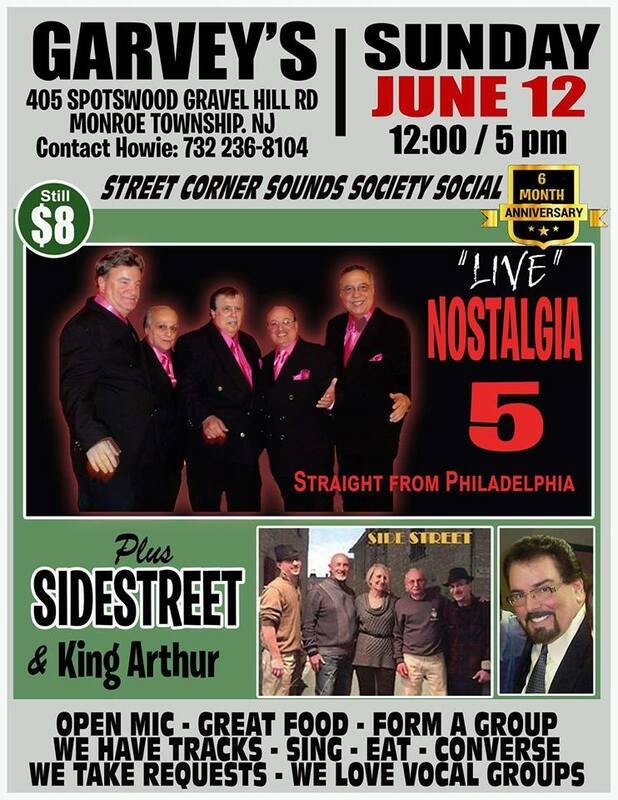 This month’s Street Corner Sounds Society Social at Garvey’s Restaurant will feature Nostalgia 5 and Side Street singing live, in addition to the usual impromptu singing, dj music and social gathering. Special guests will be radio personalities King Arthur & the Queen plus Cool Bobby B. The Society is celebrating their 6 month anniversary. It takes place Sunday June 12 from Noon to 5 PM at Garvey’s Family Restaurant, 405 Spotswood Gravel Hill Rd, Monroe Township, NJ. For info contact Howie at 732-236-8104.